You know that feeling where you’re in this wonderful place between being consciousness? It’s that deep state of relaxation that makes you feel like you’re in the clouds… Well, that is exactly what a session on our Far Infrared Healing Table can do for you. But how exactly does it work?! The BioMat, which is featured during these sessions, combines the wonders of far infrared light, nature’s superconductor and negative ion therapy to provide amazing results! 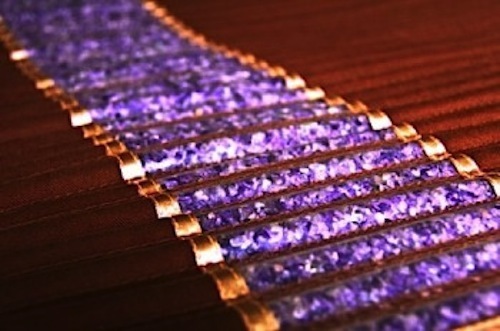 Well, the BioMat is a pad made of amethyst crystals which intensifies the effects of the far infrared light waves (that’s the same stuff found in sunlight, without the harmful UV/UVB rays). Far infrared rays were discovered by NASA to be the safest, most beneficial light wave by it’s ability to reduce swelling, increase circulation and even ward off cancer. This invisible light penetrates tissue up to 8″, stimulating the regeneration of nerves and muscle layers. The BioMat also produces Negative Ions which truly delivers a massage at a molecular level. Negative ion therapy accelerates the body’s natural healing and cleansing processes. It balances the pH by decreasing acidity and activates the body’s entire cellular communication system, making your body work more efficiently! Negative ion therapy is helpful in alleviating allergies, migraines and sinus problems. These two main components are transferred through amethyst quartz channels, nature’s super conductor. Amethyst Quartz has been scientifically found to offer the steadiest, most powerful delivery of healthy far infrared light waves and the highest vibrational frequencies into the body, aiding detoxification and helping overcome addictions of all sorts. Ready to experience the benefits yourself? You can experience the benefits of the BioMat during an Infrared Healing Table session or during Sleep Therapy. Call (805) 439-2515 to reserve your experience at our wellness spa. …by adding an IonCleanse Foot Detox. Get relief from those debilitating migraines without resorting to pain killers. Relax during this low heat treatment as the BioMat works its magic to reduce stress hormone levels and release toxic build up that can trigger headaches and migraines. Allow the warmth of the BioMat to relax your muscles and calm your nerves. The far infrared waves will put you into a natural Delta brainwave state, allowing you to fall into a deep sleep. Soothe asthma and allergy symptoms and improve respiratory health with this treatment. Melt stress, allowing your body to reduce its reaction to allergens, helping you breathe easier! Purge your body of waste acids and cut your workout recovery time in half. Far Infrared Light is essential to the functioning of our entire Endocrine System, helping to balance hormonal levels, thyroid, adrenals, and blood sugar levels. Combine the effects of balanced hormones, increased circulation and low stress levels, and you’ll be ready to get your groove back!